PMS Countdown to Christmas Sale! I'm such a bad DT member! I keep forgetting to post these fabulous sales! Paper Makeup Stamps has been having a sale for each of the 12 weeks leading up to Christmas. This week the Moody Girls are all 20% off! Katie was originally going to offer 10%, but felt thankful and generous and changed it to 20%! Here are some of my cards using the Moody Girls. Moody for Snow If you like to color, then these are for you! These girls are a blast to color up! You can get really creative with all the intricate designs on them. And don't let these designs scare you like they scared me! I was a little hesitant about them, but myself and everyone who has tackled them agrees they are just fun to color! So stop by Paper Makeup Stamps and pick up yours today. They are orginally very reasonably priced, and 20% off gives you an even better price! All you have to do is enter the code Moody20 at checkout to get your discount! On Friday, the PMS team will be starting peeks for the December release! Wait til you see what PMS has designed for you! You are going to love it! Happy Saturday, everyone! 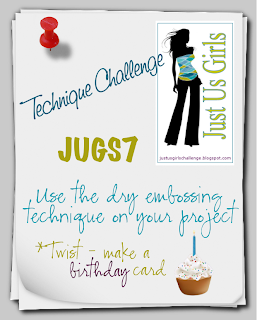 Today, the Just Us Girls team has a template challenge for you. 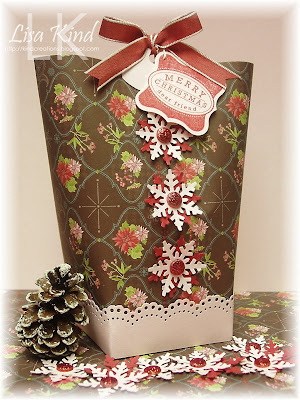 You can use a template or create one of your own...we just want to see some kind of box/bag you might use for the holiday season. And it can be any holiday! Here's mine. I went to an old favorite....box in a bag from Splitcoast stampers. I remember the first time I made one, I was amazed at how petite it was, but yet it holds a lot! I used a retired dp from SU called Holiday Traditions. That was one of my favorites because of the chocolate color I LOVE!! I paired it with Pink Pirouette (also retired). The bottom was created with a Martha Stewart punch and the handle on top is SU's round tab punch. 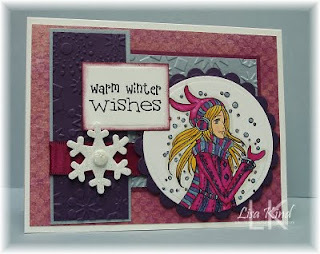 The snowflakes were punched with another MS punch in the pink and Riding Hood Red (I'm using a lot of retired paper!). It's such an easy but eye-catching bag to make! We all need some kind of packaging this holiday, so why not join our challenge? Mona has some great blog candy to give away too! Just link your direct post to Mr. Linky on the JUGs blog and use the code JUGS9 if you post to an online gallery. 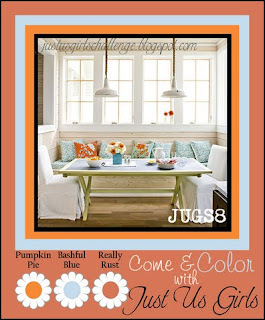 Be sure to stop by the JUGS blog and see what the girls have created. It would also be nice to leave some love on their personal blogs, as well! Thanks for stopping in today and enjoy the rest of your weekend! Hi everyone! I hope you had a nice Thanksgiving! I know I did with my in-laws. My MIL is a great cook, so we had a very delicious dinner! 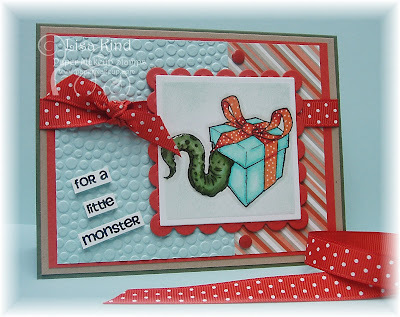 I have a card for you today for Paper Makeup Stamp's Makeup for the Weekend challenge. Today's challenge is to make anything using a Christmas/winter theme. I've used a set called Snow Happy. I like to use nontraditional colors a lot for Christmas cards. I took my colors from this Basic Grey dp called Eskimo Kisses. The green is a retired SU one called Wild Wasabi. I have to say that this card is much more colorful than it appears in the picture. 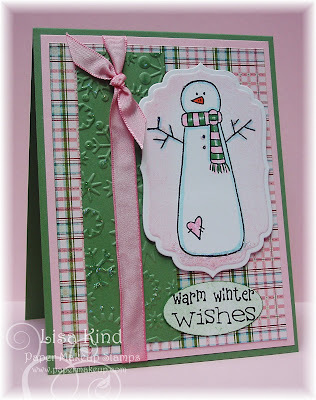 I used the Crazy 4 Challenges sketch...nice and simple and perfect for my snowman image. 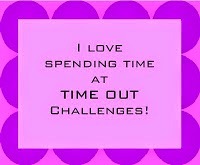 Check out the challenge on the PMS blog. We are always making Christmas/winter cards at this time, so why not play our challenge? You can link your direct post to Mr. Linky on the PMS blog. Thanks for stopping in today and have a great weekend! I wish my turkeys could always look this good! It barely makes it to the platter before my hubby is cutting into it! LOL!! This is my favorite holiday...great food, I love the fall weather, and NO GIFTS TO BUY!!! Definitely low stress! I hope you are having a great day with family and friends! 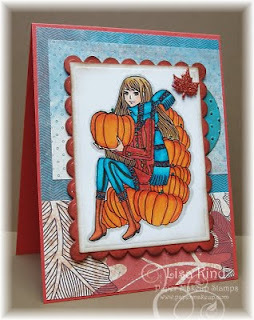 I have a Think Ink Tuesday challenge from Artful Inkables today. Deb Young is challenging us to use chipboard. 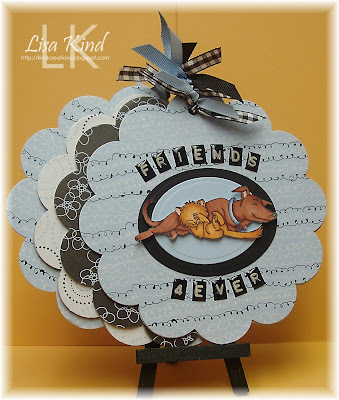 I don't have too much of this stuff, but I had gone shopping with my great stamping friend, Cheryl Rowley, this past summer and we happened to find some fun chipboard albums at Michael's for $1. They also had coordinating paper already cut to cover the chipboard! Couldn't be much easier! I had this image of the dog and cat from AI's newest release called Creature Comforts already colored and waiting to be used somehow. I decided to cut it out and pop it up on two nested ovals. I wanted to add some dedication on the front like some photo albums have, and came across these black label maker alphabet bubble letters that I had gotten at JoAnn's ages ago in the clearance bin. I came up with the "friends 4 ever" because these two look like they are best friends! How many of you have a dog and cat? I only have a dog, but my neighbors had a dog and cat and they fought, but were also best friends (kind of like kids, right?). I thought this album would be cute to document the friendship between these two pets. I finished off the metal ring with some blue and black ribbons. 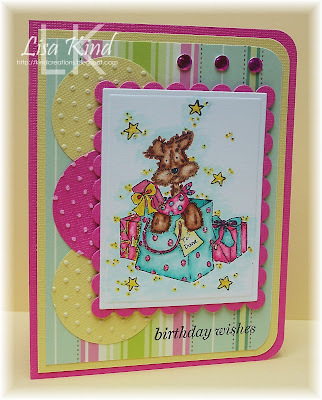 What types of chipboard do you have in your stamping stash that you are saving for just the right project? Letters, photo albums, flower shapes, or maybe you are saving the cardboard that comes with SU dp? Pull them out and put them to good use! And while you are at it, link your project to the the Artful Inkables Think Ink Tuesday challenge here. If you upload to an online gallery, use the code AIC08. This challenge goes until Tuesday, December 8. You could win an AI grab bag of stamps! We'd love to see how you use this material. Thanks for stopping in and enjoy your day. Rest up for the shopping tomorrow! LOL!! Hi everyone! 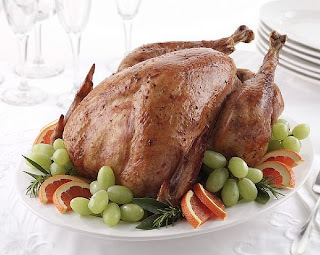 I hope you have a great Thanksgiving tomorrow! I have been making cards for my mom and in-laws for tomorrow. 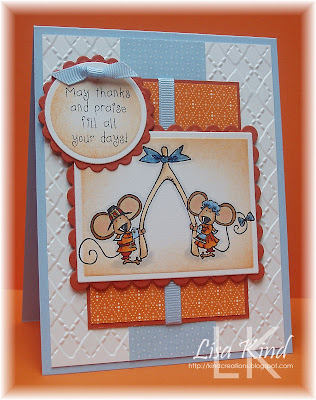 I really liked the card I made in my previous post with the mice and the wishbone, so I decided to use them again. I used the same colors, except I left off the really rust this time...it just didn't work with this sketch for some reason. I've been wanting to make these easel cards I've been seeing everywhere since SCS did a Technique Challenge on it. So fun! My MIL will love it because she always complains that my cards are too heavy and fall over! So this will solve the problem! 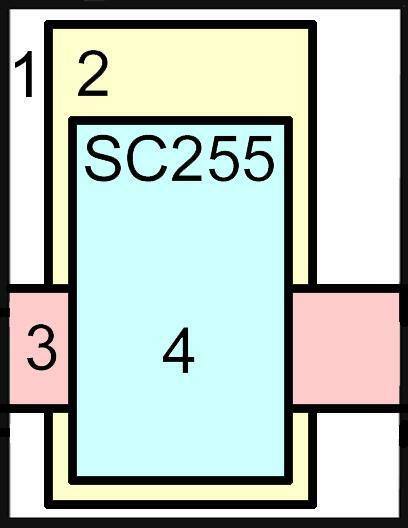 I made this a 5.25" square card and just adjusted the measurements to fit this size...so easy! 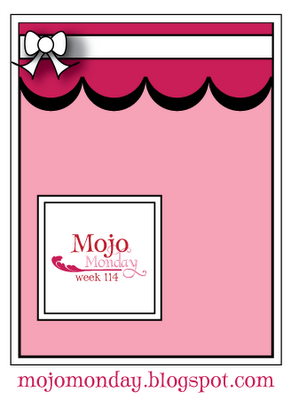 I also used this week's Mojo Monday sketch. That's all for today. I have to make another one of these for my mom! Have a great Thanksgiving! The Just Us Girls challenge blog has a fabulous color challenge for you this week. 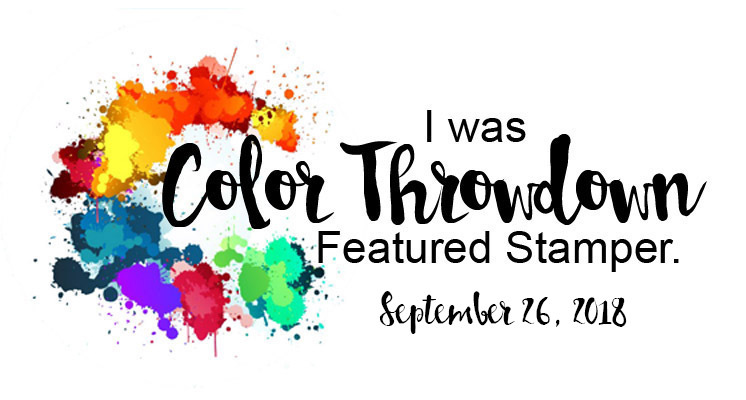 I think it's fabulous because I was the one who chose the colors! Pumpkin Pie, Bashful Blue, and Really Rust. The JUGs DT really made these colors look amazing! 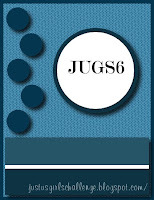 Make sure you check out their cards on the JUGs blog. This is what I did with them. I got this image recently at my LSS. It's from Art Gone Wild and it's called Make a Wish. I just love the little mice holding that wishbone. The wishbone reminds me of something my mother did with a wishbone for my wedding. She had saved one from the Thanksgiving before my wedding and wrapped it in satin ribbon which she attached to my ring bearer's pillow. The rings were placed on the wishbone. Now you have to know that my mom is not crafty at all, so for her to do something like this was such a surprise! She told me she had one on her pillow at her wedding too, although I don't know who did that for her. After I colored the image and cut and embossed the image with nesties, I swirled some pumpkin pie ink around the image while it was still in the nestie. It was just too white, and this technique really highlites the image. I did the same with the sentiment. I followed the current Mojo Monday sketch but flipped it....lots of layers on this one! I hope you can try this color challenge this week. Check out the JUGs blog for the details, but if you post to an online gallery, use the key word JUGS8. 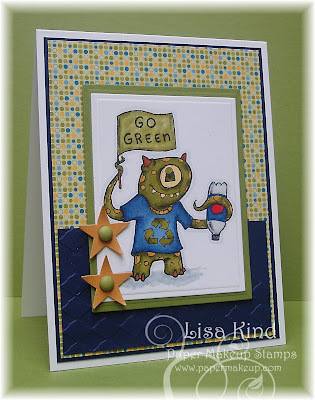 You can also post a direct link to your card to Mr. Linky on the JUGs blog. 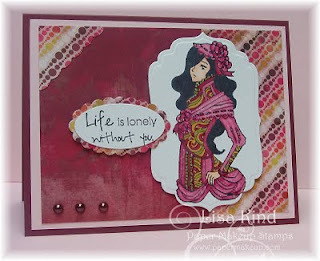 Paper Makeup Stamps is having its first Fan Blog Hop. Katie invited customers who love PMS stamps to participate. So, if you have arrived here on your own, please go to the PMS blog to get all the details and begin the hop there. Otherwise, you should have arrived here from one of our dedicated customers, Anita Hovey. 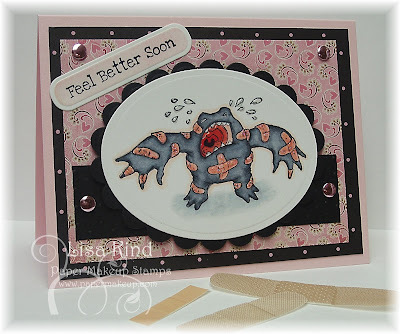 I've done a card for the Makeup for the Weekend challenge. This month it's a color challenge that I thought was going to be a difficult one....but I managed to pull it off. The colors are olive, navy, and mustard. I used a new stamp called George for this one. He's just too cute! I found the colors in SU's retired Good Morning Sunshine dp. The navy blue piece was run through the diamonds cuttlebug folder. I put crystal effects on the plastic bottle to make it look more realistic. I followed the sketch from the Makeup for the Weekend challenge from last week. 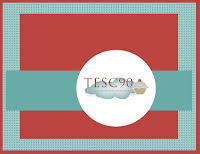 Now you can continue on the hop and go to the blog of another loyal customer, Emily LePage. Thanks for stopping in and have a great weekend! Hi everyone! It's Thursday, so I have another Artful INKables creation for you. I love this set called A Bird's Song (I think it's one of my favorites of all the AI sets!). Here's what I did with it and the sketch from SCS yesterday. I started with this great sketch (but flipped it on its side) and Basic Grey's Indian Summer dp. I then colored the bird and leaves accordingly (although I'm not sure about the colors I chose for the bird!). The bird image and crushed curry mat were cut and embossed with nesties. I swirled some Marigold Morning ink around the edges of the image and sponges some Soft Suede ink around the edges of the crushed curry (it was just too bright!). The ribbon is soft suede grosgrain ribbon. 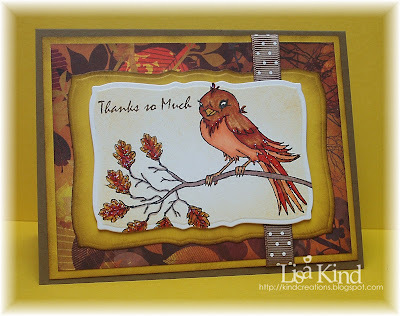 I added the sentiment in Soft Suede ink and some star dust stickles on the leaves and bird's feathers. The girls over at Artful INKables are having a Twilight blog hop on Friday. I'm not much into that series, so I opted out. But if you are a fan, check it out. There are a bunch of customers of AI that are participating too and it looks like it's going to be a great hop! Thanks for stopping in today! I'll have something fun tomorrow for you, so please stop by again! Can you believe it's another release day for Artful INKables? We are showcasing the new sets being released today with another blog hop, so if you are arriving here from Jackie Rakoski's blog, you are on the right track. If not, start at the Artful INKables blog which is the beginning of the hop. I'm sharing a great set that is geared toward Valentine's Day (yes, I said Valentine's Day! ), but it can be used for a variety of other occasions. It's called Love Ya Lots. I was thinking all day about how I was going to do this card. This stamp is a very solid line image that if stamped in black ink would be more like a silhouette, which would look very cool. I wanted it to be more soft and feminine, so I took out my water color crayons, water color paper, and mister. I colored the flower in two shades of pink and the stem and leaves in two shades of green. Then I spritzed it with water and stamped it on the paper. I love this look! It's just so soft and pretty! It was then cut and embossed with the Labels Four die and I cut and embossed another larger one in black. 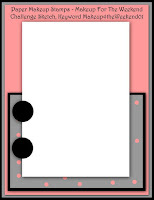 The dp is Eva from Basic Grey and the pink card stock is Pink Pirouette. I added the sentiment, pewter Kaiser pearls, and the pink satin ribbon. So do you want to see more of the new releases? Hop over to Emily Niehaus's blog to continue on the hop. Thanks for stopping in today and enjoy your Sunday! Hi everyone! It's Saturday, so it's time for another challenge from Just Us Girls! And one of our girls is celebrating her birthday today...Dana Gustafson! 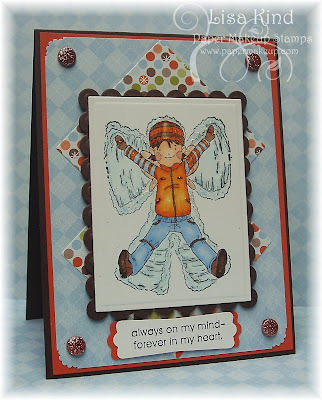 So, our challenge is to use dry embossing on your card with a twist...make it a birthday card in honor of Dana! We tricked her today and told her the twist was to make a thank you card! I hope she was surprised! Here is my card for Miss Dana which will be in the mail this weekend! I've been itching to use this image from Stampavie for a long time! It's called Surprise and it's been sitting on my desk waiting for this perfect challenge! 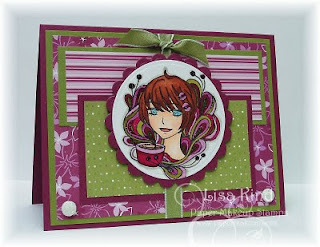 For the dry embossing part of the challenge, I used the swiss dots cuttlebug folder on Cordinations paper. I sanded it a bit, but it doesn't show up very well in the picture. I don't know the name of this beautiful dp that started my color combo. I purchased it at my LSS in the summer and the back of it is just gorgeous! I hated to cover it up! I just love how bright and fun this card is! 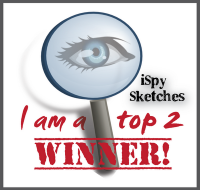 Oh, and I used my own sketch! This is something that is very difficult for me, so I'm very proud of myself! LOL!! 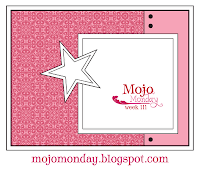 If you want to see more inspiration from the Just Us Girls team, stop over at the JUGs blog. We'd love for you to make a card honoring Dana's birthday. Just link up your direct post to Mr. Linky on the JUGs blog. If you post to an online gallery, use the key word JUGS7. Also, please don't forget our Charity Challenge. We are trying to raise some money for a fellow stamper, Sarah Anderson, who lost her son recently. Check out the challenge on our JUGs blog here. There is some blog candy being offered by the JUGs team and from one of our followers, Gabby. (For some reason, I cannot connect to her blog...it keeps freezing up on me. You can click on her link in Mr. Linky to see what she's offering up as blog candy.) So please check it out! Oh, and yesterday was my hubby's birthday! Friday the 13th! He kind of had a bad day hunting, too! Happy Birthday, Darling! Thanks for stopping in today. Have a great weekend! I have another post today, so please scroll down! Our Just Us Girls team has paired up with Paper Makeup Stamps to do a charity challenge for the Anderson family. Fellow stamper, Sarah Anderson, lost her son suddenly last week, and Katie Cotton has named one of the Beautiful Day Fairies after her son Henry. 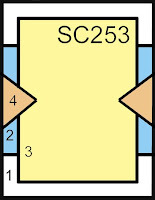 The image is available in rubber as well as in digital format. The proceeds from the digital image are going to the Anderson family. So the challenge is to purchase the digital image from Paper Makeup Stamps (you can find it right under the Categories section on top), make a card, and post it on the JUGs blog. There is a $15 shopping spree at Paper Makeup Stamps for a randomly chosen winner. Go to the JUGs blog for more information and for some inspiration from the team and Katie Cotton. Here's the card I made with the image. Cute image, isn't it? I remember making these in the snow as a child. We'd love for you to play our challenge, as it's for a great cause! We'd really like to add to the proceeds that PMS is raising for this grieving family. I can't even imagine their pain. Hi everyone! I'm here with another Think INK Tuesday Challenge from Artful INKables. Crystal Irwin is challenging us to make tags...any kind of tags. I recently saw a cute tag in a stamping magazine, and was thinking about making one similar to it. But then I got to thinking about a box of Avery tags that I had purchased to alter a log time ago, and decided to use some of these instead like I originally intended! 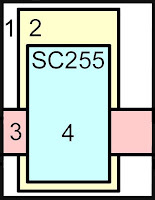 I went through my AI stamps and looked for smaller images that would fit onto these approximately 2 3/4" x 2" tags. 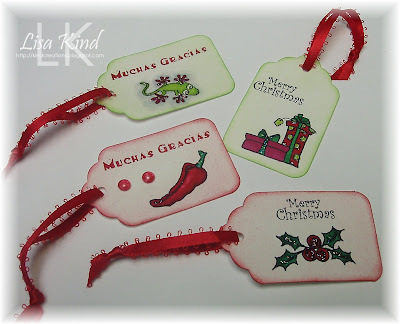 I pulled out South of the Border because of the Muchas Gracias sentiment and Holiday Treats and Tails for Christmas tags. These literally took me 30 minutes to make. They were plain white, and after I stamped and colored the images, I swirled some color on them with a soft brush and sponged the edges for more definition. I added star dust stickles to all the images...it always makes them more special. 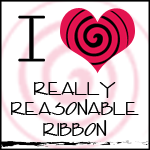 I cut off the plain white string that comes with the tags and added this pretty red ribbon which was a scrap piece in my ribbon stash. Wouldn't these look so pretty on a bag or a box instead of the pre-printed ones that come with some bags? I think so! So why not try one or two or three or four? LOL! You can post your direct link to Mr. Linky on the AI blog. If you use AI stamps, you get two entries! If you post to an online gallery, please use the code AIC07. Thanks for stopping in today! For the "foundation", the embossed cardstock is the horizontal black piece. I ran it through the swiss dots cuttlebug folder. 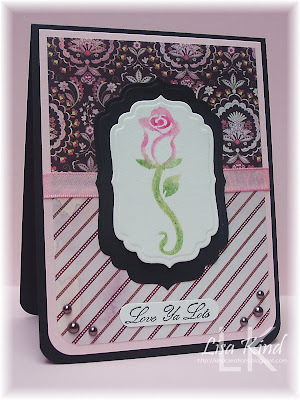 I used pink cardstock and dp for the "blush", and black cardstock and dp for the "eyes". For the "lips", I put star dust stickles on the bandaids and crystal effects on his mouth and tears. I used the Taylored Expressions sketch from this week as my starting point. Thank goodness for these sketch challe nges....I have such problems with coming up with my own! If you play, don't forget to use the key word PMSRP18 if you post to an online gallery. Thanks for stopping in today. Your comments are greatly appreciated! Have a great Sunday! Hi everyone! I have a two-fer going on here today with one card! 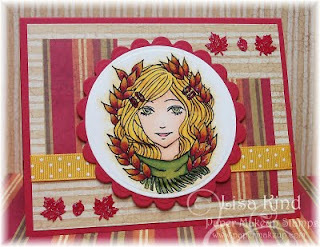 Two birds one stone....the Paper Makeup Stamps blog hop for their November release and the Just Us Girls challenge. I decided to combine the two. So, if you want to hop with the PMS DT, start at the PMS blog to get your directions. 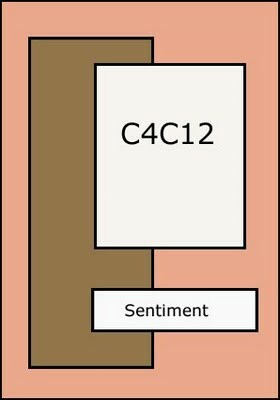 You will pick up a letter at each blog, which will get you a code to use for 15% off on your entire order for the week. My card today uses a new PMS image called Twisty Tree. 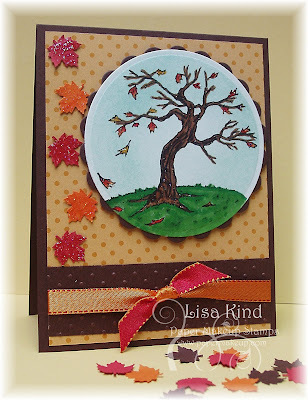 A great gnarled tree that can also be used for a Halloween-themed card as well. I also used the Just Us Girls challenge, which is a sketch this week. It's a great one done by Maria Levine...here it is. And here is what I did with this sketch and the new Twisty Tree image. I like the falling leaves. I had this idea the minute I saw the sketch! I think the punch is an EK success punch...the one that folds flat. I've had it for a while and this is the first time using it. Now, if you are here for the hop (and why not hop along with us? ), your letter from me is "T", and you have to continue on to Randee's blog for your next letter and to see her fabulous creation. Don't forget to come to our release party tonight at the PMS forum at 8:00 pm CST. They are always lots of fun. If you came here for the JUGs challenge, you can link your direct post to Mr. Linky on the JUGs blog. If you post to an online gallery, please use the code word JUGS6. Thanks for stopping in today, and remember to hop over to Randee's blog for the PMS hop! Today is the last day of sneak peeks from Paper Makeup Stamps, and we are previewing the some new fairies. I have Ms. Nancy, the teacher fairy, to introduce you to today. I have to tell you a little story behind Ms. Nancy. Our PMS design team often gives Katie ideas about what we'd like to see in stamps. I suggested a teacher, since I'm a teacher. Well, I guess I had a different version of a teacher than Diem, the artist! I was expecting young and pretty, not older and frumpy! But I must admit that I really like this old broad! LOL!! (I even told Katie that!) Once I got her all colored up and on this card, I really warmed up to her! 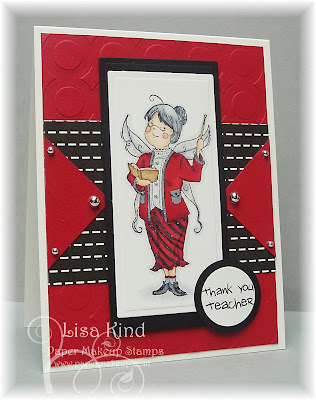 I think she's a cute old broad and the perfect image for a teacher! I found this dp from PTI's Black & White Basics, and it has always reminded me of a chalkboard for some reason! So I had to incorporate it into my design. The sentiment is also from PMS. It comes with Schoolie Ed monster. I used the SC S sketch challenge from this week. 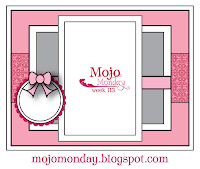 Stop by the PMS blog to see what the others have for you today. You won't be disappointed! Please make sure you join us for the blog hop tomorrow all day, and then the release party at the PMS forum. Thanks for stopping in today! We have day 3 of the sneak peeks for Paper Makeup Stamps. Today I have a Monster of a Gift to show you. I just love this image! It's so different from anything I've ever seen. I used two different challenges for this. I took the colors from the Color Thowdown #67 which were soft sky, always artichoke, kraft, and dusty durango. I found some retired dp from SU called Fall Flowers which had these colors in it. I ran a piece of soft sky though a cuttlebug folder...it's sort of "scaley" looking to me. I colored the image with copic markers and added crystal effects to the tail to make it look slimy, and I added white gel dots to the ribbon to mimic the actual ribbon. 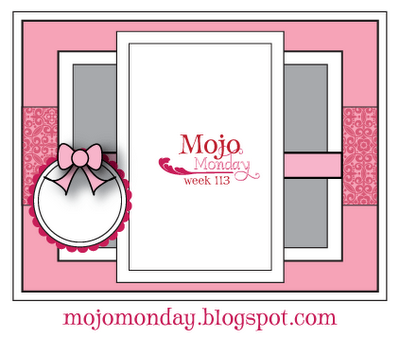 The sketch is from the Mojo Monday blog. Want to see more? Stop over to the PMS blog and see what the other Paper Makeup Artists have to share with you. Don't forget that these stamps will be released on Saturday, November 7. We'll be hosting a blog hop all day and a release party on the PMS forum in the evening, so plan on attending. I'll have another sneak for you tomorrow, so stopy by again! Thanks for stopping in today! Just Us Girls Birthday Wish Blog Hop for Kristin!